It's great to see the world's most renowned bee wrangler, Norm Gary, emeritus professor of entomology at UC Davis, come out of retirement to help out with a specific "UC Promise for Education" project spearheaded by UC Agriculture and Natural Resources (UC ANR) Vice President Barbara Allen-Diaz. In her promise to help UC students in financial need, Allen-Diaz says that if she raises $2500 by Oct. 31 she'll wear bees. Maybe not on her head, but on a UC ANR T-shirt or a UC ANR banner she'll be holding. And if she raises $5000, she'll eat insect larvae. Enter Norm Gary. 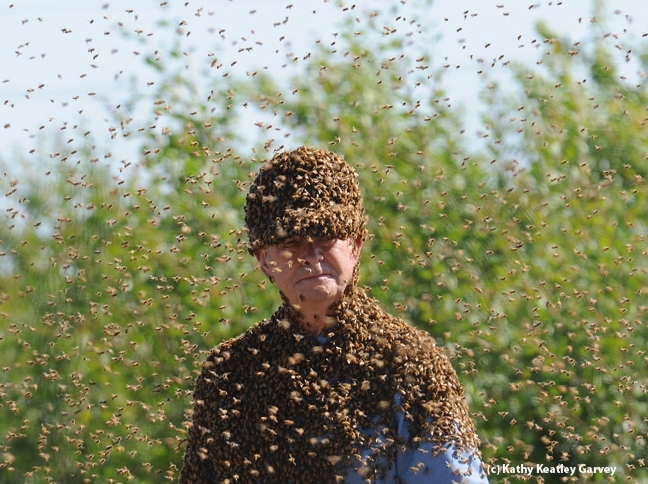 He'll be 80 in November and he retired from beekeeping last month after 66 years (yes, 66 years) of beekeeping. He earlier retired from UC Davis (1994). During his 32-year academic career, he did scientific bee research, wrote peer-reviewed articles and book chapters, crafted inventions, and wrangled bees. As a professional bee wrangler, Norm Gary is the guy that Hollywood movie directors picked to train bees for their productions. He's also appeared on numerous TV shows, orchestrated bee cluster stunts, and periodically played his b-flat clarinet while wearing a full bee suit from head to toe. He once trained 109 bees to enter his mouth (he holds a Guinness Book of World Records for that). Read more about his accomplishments (UC Davis Entomology and Nematology website) and on his personal website. If Allen-Diaz raises $2500, the stunt will take place next spring at the Harry H. Laidlaw Jr. Honey Bee Research Facility at UC Davis. If she raises $5000, it will be time to devour some tasty insect larvae! You can donate $10, $15, $20, $100 or more by accessing Allen-Diaz' promise page. Just access http://promises.promiseforeducation.org/fundraise?fcid=269819. You can also add a few comments as to why you're donating to help UC students. It could be in memory of a loved one, because you support the good work that UC ANR and Barbara Allen-Diaz do, or because you want to honor the amazing career of Norm Gary. Or, you just may want to help raise public awareness of our declining bee population. As Allen-Diaz says: "I am a true believer in the importance of honey bees and the importance of bees as pollinators in our agricultural and wild ecosystems. The health of agriculture and the health of the planet depend on the health and survival of our honey bees."